The launch board is a board with the power and volume control buttons located under the keyboard bezel. I’m replacing the launch board because one of the volume control buttons got stuck in the pressed position and because of that the volume is set to maximum all the time. When I try turning it down, the volume slider goes up by itself. Cleaning the button with alcohol and contact cleaner didn’t help and I decided to replace the board. Insert a small flat head screwdriver under the keyboard bezel and carefully lift it up. The launch board is located above the keyboard. In order to release the launch board cable we’ll have to remove the keyboard first. Lift up the keyboard as it shown on the picture below. If you are replacing only the launch board, it’s not necessary to disconnect the keyboard from the motherboard. If you decide to remove the keyboard, you’ll have to unlock the connector first. On the picture below you can see the connector in the unlocked position. Now you should be able to release the cable and remove the keyboard. Remove two screws securing the launch board. Disconnect the launch board cable from the motherboard. Lift up and remove the launch board. 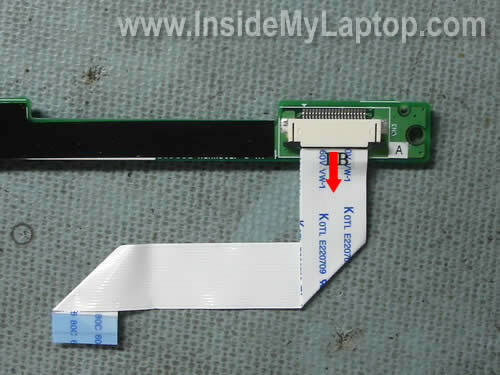 Transfer the flat ribbon cable to the new launch board and install it back into the laptop. same method for the lenovo 3000 N200. Almost the same for 3000 N100 – launch board cover needs to be removed starting at the right, cover is wider, going up to and including the gray screen hinge covers, and there are 2 screws on the top of the keyboard – I only replaced the keyboard, but the launch board looked almost exactly the same pre-removal. Thanks for the info! My experience with my 3000 n100 was similar to Mr. Davis’, except that on my keyboard connector, there did not seem to be the locked/unlocked issue. My keyboard connector was white and anchored down with two metal pieces that I could not dislodge and was afraid to try to force. I just pulled — GENTLY — on the ribbon and it easily slid out. I merely paid attention to which side was ‘up’ when I took it out and inserted the replacement in the same direction (stiff piece of extra plastic facing down). I, too, only replaced my keyboard and the only other thing I’ll mention — which admittedly is a bit off topic — is that my keyboard (purchased off ebay from Hong Kong at a cost of $7 + shipping of about that) while it was listed as being for this model 3000, and is identical in most respects, has perversely moved around the function keys so that I’m now sort of confused as to how to reassign them (if that’s even possible). So if you’re a novice do-it-yourselfer make sure you get a good image of the keyboard replacement including the orange function keys (if you use those and they’re important to you). Otherwise, thanks to this site I’m up and running again and have all new keys. Thanks so much!!! On a 3000 n100, I noticed it was easier to pry up the launchboard by “popping” the tabs on the sides of the launchpad with a small screwdriver. My keyboard had 2 screws holding it down. The one that’s circled in the image above and one just above the ESC key. I also found locking tabs on the white keyboard connector. They were black and on each side of the connector. Almost Same for my Lenovo Y410. Except It has 2 keypad holders. Unscrew and install keyboard same as you explained. Great step by step instructions. I removed the keyboard only in my Lenovo 3000 N100. The ribbon connector unlocked just as you illustrated as did everything else.Thank you. The 5 and 6 key quit working on the Lenovo three days out of warrenty. The IBM service people gave an estimate of $300.00 to repair. After reviewing your post I pulled the keyboard in 5 minutes, found a new one on Amazon for 22 bucks and ordered it. 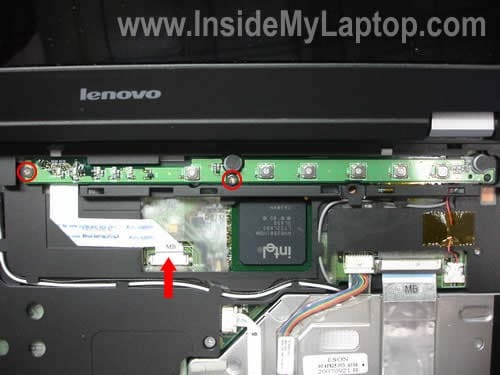 I just replaced the keyboard for my Lenovo 3000 N200 0769 laptop using the part #42T3338, an exact replacement for the original, several of whose keys had quit working after 2 years of heavy daily use. This part # has 2 screws holding it down, one where illustrated & the other above the F1 key. 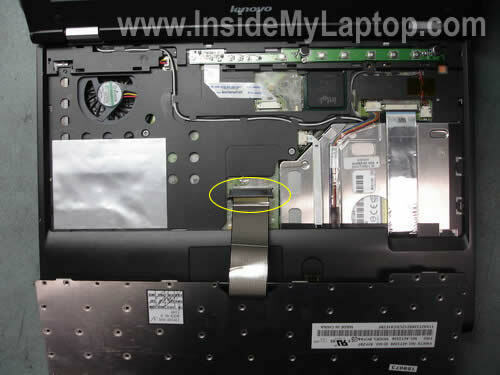 In addition, an official Lenovo 3000 service video shows 2 screws accessible only from the battery compartment that are supposed to be removed before the keyboard is removed. I don’t know what they connect to, but I removed them also. The key difference was the keyboard’s ribbon cable connector, very different from what is illustrated in Step 2. 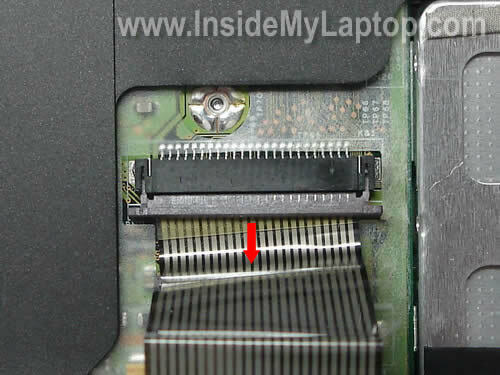 My keyboard ribbon cable actually was attached from above, not below as illustrated here. There were 2 separate latch pins on either side of the ribbon connector, each about 3 mm high and 1 to 3 mm wide. Each latch pin has to be moved up about 1.5 mm to release the ribbon cable. If not fully moved up, the ribbon cable is still partly clamped in position. It would be easy to damage or destroy the latch mechanism if you are too rough. High magnification and bright lighting are important so you know what you are doing. To reassemble, put the ribbon cable into the connector’s slot as far as it will go, hold in place while very gently pushing each latch pin back down into locking position. Thanks for the instructions. I had 5-6 keys go dead after a drop of coffee hit the keyboard so i purchased a replacement from Amazon. I have the Lenovo 3000 N200, the new keyboard works great, and is even faster and more responsive than the old keyboard. It should be repeated that this replacement kb is labeled in a different manner than the original. The “Fn” keys are labled incorrectly. I rarely use these keys anyway, Im happy to have my T, Y and backspace back! Thanks so much for the instructions. They worked great for my lenovo y410 keyboard replacement. Kudos!! BTW can some one please advise me whether some cleaning should be done before I replace the keypad??? It depends on the spill. You’ll have to remove the keyboard and take a closer look underneath. If there is no liquid under the keyboard, no cleaning necessary. It works for Lenovo g430, although I had to remove the three screws after taking out the battery. Thanks. when taking things apart and putting them back together — how critical is it use new screws? the lenovo manual says use new ones, but i’m wondering if it’s such a bad idea. 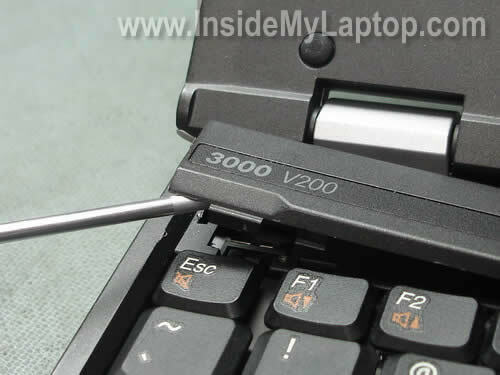 It seems to me that the instruction to remove the keyboard of Lenovo 3000Y 500 are different. Please post the same. 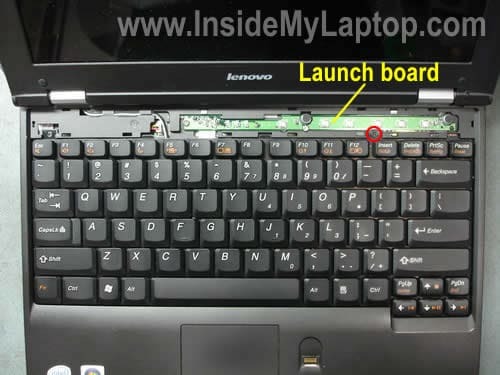 When putting my Lenovo 3000 N100 back together, I can’t get the launch board cover (above the keyboard) back on flat. I’ve removed it / replaced it / removed it many times and I always get a bow in the middle. It still works fine and I can push the power on but it just takes a little more of a mush because you have to push the cover down too. I guess you’ll have to remove the cover again and take a closer look at the bottom part of the cover. Maybe you have a broken/damaged/bent latch in the middle? 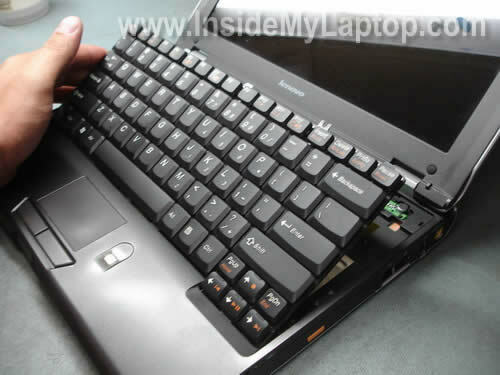 does anybody know where i can find the disassembly guide for a lenovo g550? Thanks so much!!!! I just used it to replace my Lenovo 3000 N100. directions close enough to get my 3000 n100 keyboard removed and replaced. Well written instructions. they are not working maybe i need to push something else! Could i reset the CMOS from here, i can’t see the battery in the pics. Would i have to come in from the other side? 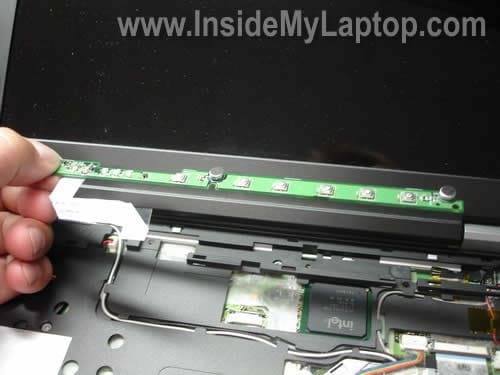 In that case would you have a guide for fully taking apart this laptop, i have tried before and i couldnt get it. 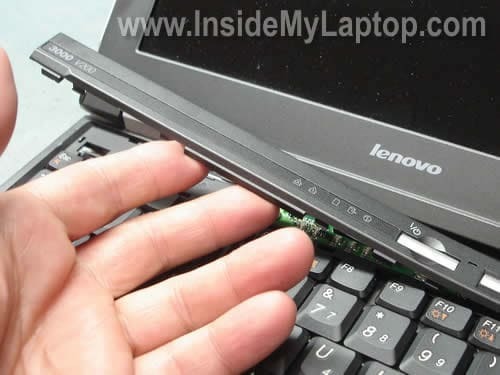 I have a laptop lenovo g550 model L08S6Y02 and I forget the password boot the laptop, told me to take the battery CMOS is removed, but I opened the back and we could stack, could you please help me? The people where the keyboard typed multiple characters are more lucky than me. My keyboard doesn’t type anything when i press any key!!!. I just spilled a quarter gallons from a 250 ml glass and my keyboard doesn’t do anything. Where can i buy a laptop keyboard or repair mine?? The thing that i really wished to say is that my laptop is a bit different than yours. 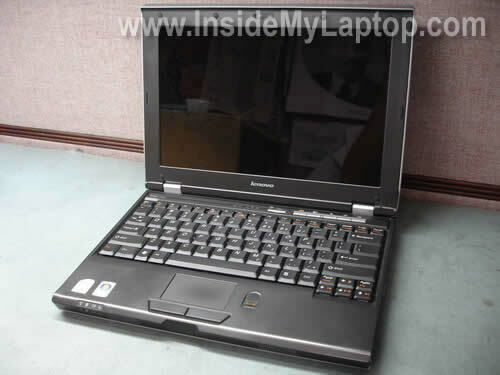 It is a lenovo laptop, i think its’s 3000 but the keyboard is not linked to the bezel. Any help?? ?